In this article I will make tutorial about how to make read, write and delete cookies in ASP.NET WebPages 3.1. Cookies are a small text file containing information about a user; for example, a cookie may contain information on the last video the user watched or what items they have in their shopping cart. Many e-commerce websites like Amazon save cookies to your computer that can either collect your data or store the items in the shopping cart. In Microsoft WebMatrix create a new website based of the Personal Site template name the website Cookies. Next in the root folder create a page called Settings.cshtml. Writing, reading and deleting a cookie are all fairly simple, as will be displayed in this tutorial. We will give the user an option to choose between two site layouts, and once they select which one they prefer a cookie will be saved to their computer. This will be read by the main master page and it will load the correct style sheet. If you do not specify when the cookie expires then it will automatically expire at the end of the session (when the user closes their browser). Here we have var layout which requests the HTML control layout. After the user is given an option, if they choose Dark a cookie with the name Theme and value Dark will be saved to their browser, and it expires in one year. Leave the option default for now because we will come back to it. Now run the page and select Dark as your theme; the page will refresh. Then in your chosen browser go to your stored cookies and you should see that a new cookie has been made called Theme (this should be under a folder called localhost by default) with the value Dark. For chrome users simply copy and paste this in the address bar of your browser: chrome://chrome/settings/cookies. The domain which inserts the cookie can read the cookie. So for example, if thecodingguys.net writes a cookie called "Theme" Google.com cannot read that cookie. This will apply to sub-domains as well; m.thecodingguys.net cannot read a cookie which was created by www.thecodingguys.net. Now the cookie should be inserted in your browser. Before we can read the cookie we need to make a new layout, so we will make a new style sheet. In the content folder copy the Site.css file and paste it in that folder, and re-name it to Site_Two.css. Next open the Site_Two.css find the body style and change the background colour to a colour of your choice (make sure it is different than the default). The first If Statement requests the cookie by name, not the cookie value but just the cookie named Theme. We need to make sure it is not null (meaning it exists), and then if it exists read the value. If the value is Dark, and it will load the second style sheet. Now if the cookie is not there it will load the default style sheet. Deleting a cookie is simple: on submit if the user selects the Default option the cookie is deleted. There is no direct command to delete the cookie, all we do is set the expiry date to a previous date. In this case it is set to the year before meaning it has expired and the browser will delete it. Reading, writing and deleting cookies is quite simple. Cookies are very useful when you want to have full control overs users and provide extra functionality. Remember that cookies are client sided so users can disable them if they want to. Also remember that there are some laws (EU Law) regarding cookies, so make sure you inform users you are saving cookies. At times you will need to access a database to perform tasks such as updating and removing information. Here, I will show you the most commonly used SQL statements such as reading from database, updating database and deleting database entries. To connect to a database you use the Database.Open command then in brackets you give the database name. The database must be in the app_data folder (unless you specified it somewhere else in the web.config). The database name must be wrapped in quotation marks; you do not specify the database extension. Try our ASP.NET WebPages 3.1 with Free ASP.NET Hosting today and your account will be setup soon! You can also take advantage of our Windows & ASP.NET Hosting support with Unlimited Domain, Unlimited Bandwidth, Unlimited Disk Space, etc. To continue the last tutorial about how to insert data page in ASP.NET Web Pages 3.1, today I'm gonna tell you how to read the data page that we have inserted with example code. The first thing to do is create a variable db which opens the database. Then, you will have another variable called GameName which is set to get the RouteValue from the URL (we will use routing for clean URLS). Beneath that is an If Statement which checks if GameName is null, if it is, the user is redirected back to the home page. The data variable is now set to retrieve data from the database and only for the current page, since the where clause has filtered out the rows. Usually you only want to retrieve one row and place the data where you would like it to go. This is easily done when you type data after the dot (period): you specify the column name and the data for that row will be displayed. You can create the ID variable because it's a need to output the result a few times, as seen below. The Html.Raw method will render the HTML properly, and this is another built-in ASP.NET security feature. If you do not use Html.Raw, you will get the HTML source printing out. The ?id=@id is a parameter and is used to pass data to the other pages. For example, when the user goes to the update page it will request the value of ID and will load that row from the database. So if ID= 1 it will load row 1. The same applies for delete page, although instead of updating the page it will be deleted. The returnurl as seen above is used to redirect the user back if the user rejects the confirmation to delete the page. This time we used the db.Query method. This gets all the rows from the table. Then we displayed all the results in an unordered list, which will allow us to view the games list from the default page instead of having to type it in the address bar. 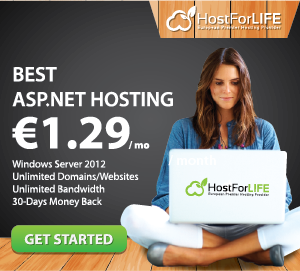 Try our ASP.NET WebPages 3.1 with Free ASP.NET Hosting today and your account will be setup soon! You can also take advantage of our Windows & ASP.NET Hosting support with Unlimited Domain, Unlimited Bandwidth, Unlimited Disk Space, etc. You will not be charged a cent for trying our service for the next 3 days. Once your trial period is complete, you decide whether you'd like to continue. In this post, I will tell you how to insert data page with example code in ASP.NET Webpages 3.1. Then you have created 5 variables which you will use to collect the user-entered data and then insert the data into a database. The second variable is a DateTime data type. The second column in the database is for DateTime. The user will not have to specify the ReleaseDate, as it has been set as the current UTC date and time. This will flag an error because the second column expects a data type of DateTime. It is good practise to keep the order of the columns as they appear in the table. One thing that should be explained is the <script> tag. We will use CKEditor for our <textarea>, as this allows us to add HTML styles. Finaaly, you can run the page and add a new entry, and remember the title for the GameName. Make sure the GameName does not have any spaces or characters; stick with numbers, letters and dashes only. As you know, ASP.NET comes in three types: MVC, Web Forms and WebPages. 1. Web Forms - This is the classic ASP.NET framework; it has all the server side controls and is used for creating dynamic websites. It does have a steep learning curve and controls most of the mark-up so there is little control. It is event-driven and is good for RAD (Rapid Application Development). 2. MVC - Model-View-Controller, this framework also has a steep learning curve, however, it is ideal for developers who like to have control over their websites and like to separate logic and UI. It is ideal for team based work. Today, I will introduce to you about ASP.NET WebPages. You can use ASP.NET WebPages to create dynamic web pages. A simple HTML web page is static; its content is determined by the fixed HTML markup that's in the page. Dynamic pages like those you create with ASP.NET Web Pages let you create the page content on the fly, by using code. Dynamic pages let you do all sorts of things too. You can ask a user for input by using a form and then change what the page displays or how it looks. You can take information from a user, save it in a database, and then list it later. You can send email from your site. You can interact with other services on the web (for example, a mapping service) and produce pages that integrate information from those sources. Most examples of using ASP.NET Web Pages with Razor syntax use C#. But the Razor syntax also supports Visual Basic. To program an ASP.NET web page in Visual Basic, you create a web page with a .vbhtml filename extension, and then add Visual Basic code. You'll need to use IDE when working with Web Pages and the ideal IDE that will compatible with ASP.NET WebPages is Microsoft WebMatrix. Microsoft WebMatrix is a small IDE which was released alongside ASP.NET Web Pages. WebMatrix is a tool that integrates a web page editor, a database utility, a web server for testing pages, and features for publishing your website to the Internet. WebMatrix is free, and it's easy to install and easy to use. It also works for just plain HTML pages, as well as for other technologies like PHP. With WebMatrix you can start from scratch with an empty web site and a blank page, or build on open source applications from a "Web Application Gallery". Both PHP and ASP.NET applications are available, such as Umbraco, DotNetNuke, Drupal, Joomla, WordPress and many more. WebMatrix also has built-in tools for security, search engine optimization, and web publishing. The skills and code you develop with WebMatrix can seamlessly be transformed to fully professional ASP.NET applications. But, you don't actually have to use WebMatrix to work with ASP.NET Web Pages. You can create pages by using a text editor too, for example, and test pages by using a web server that you have access to.